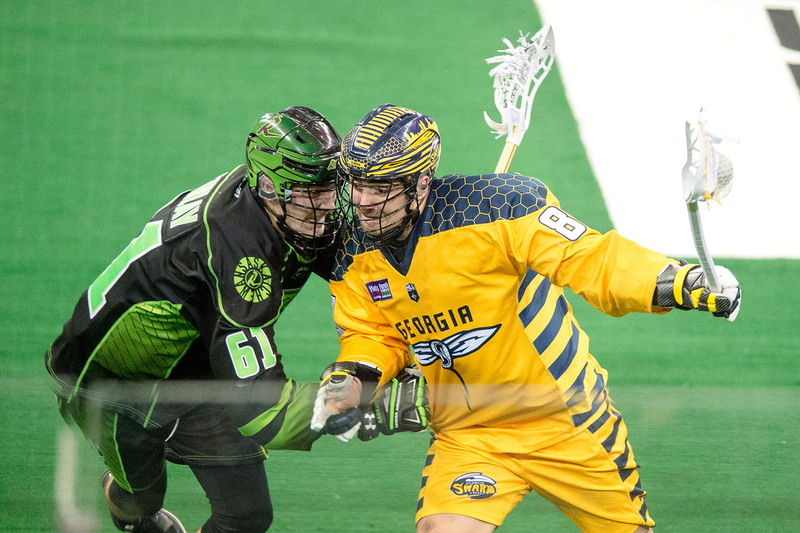 After recording their first two loses of the season last week the Georgia Swarm bounced back at home in big way taking down the defending champions Saskatchewan Rush 13-10. Georgia got in the game very early as Lyle Thompson scored the first goal just 22 seconds into the first quarter. 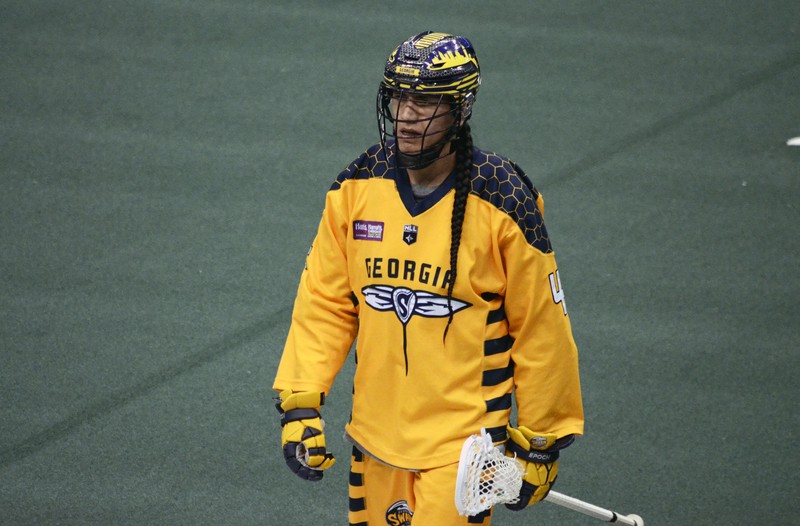 Thompson’s goal was just the start of an early offensive explosion for the Swarm. With Georgia holding a 5-0 lead near the end of the first Saskatchewan would make a change in goal as Evan Kirk was pulled for Adam Shute. Saskatchewan finally found their footing on offense with a Mark Matthews goal late in the first. As Georgia held a 6-1 lead heading into the second quarter both defenses stepped up. Only two goals were scored in the entire second quarter. Zed Williams scored for Georgia and Jeff Shattler for Saskatchewan. That defensive stand from both squads in the second meant that Georgia led 7-2 heading into the half. In the third quarter Saskatchewan got a little more momentum, cutting Georgia’s lead to four at one point. Though Saskatchewan’s efforts would help their pull closer, Georgia’s defense didn’t let them get close enough. Georgia’s offense would have an answer as well. Each team scored three times in the third. Entering the fourth quarter Georgia held a 10-5 lead over Saskatchewan. However, that lead would start to diminish as Saskatchewan’s comeback efforts got stronger as the quarter progressed. The Rush started the quarter with a two-goal run to pull within 10-7. Georgia would answer with two of their own to get that cushion back. Marty Dinsdale’s goal midway through the fourth was the first of a three-goal run for the Rush, who had a big quarter. That run would diminish Georgia’s lead to 12-10. After a long drought for both sides, John Ranagan found the empty net late in the game to secure the 13-10 win for Georgia. Jeff Shattler and Marty Dinsdale led the way for Saskatchewan. Shattler put up seven points (2G/5A) while Dinsdale tallied four points (3G/1A). Travis Cornwall played a big part on Saskatchewan’s defense, causing a turnover and scooping up five loose balls. Lyle Thompson and Randy Staats that led the way for Georgia. Thompson tallied seven points (2G/5A), including his 300th career point, while Staats contributed nine points (2G/7A). On defense it was Tutton that helped lead the way as he cased four turnovers and scooped up three loose balls. Adam Shute, having made only two prior NLL appearances, made 28 saves on 35 shots on goal for Saskatchewan while Mike Poulin made 46 saves on 56 shots for Georgia. Shute played just over four minutes for the Swarm in 2017. Both teams have quick turnarounds as they will both be in action on Friday night. Saskatchewan is in Toronto while Georgia hosts New England. The Swarm are then on the road the next day in Rochester.